Two of summer's best! Healthful wild salmon and fresh basil pair beautifully in Thai Salmon Cakes with Basil Lime Mayonnaise. SALMON CAKES: Preheat oven to 375 degrees. Season salmon with salt and black pepper. Bake for 12-14 minutes or until salmon can be flaked with a fork. Cool 15 minutes. Combine scallions, red bell pepper, cilantro, garlic, lime juice, ginger, fish sauce, red curry paste, chili garlic sauce and panko in a bowl. Season to taste with salt and black pepper, adjusting any other seasoning as desired. Flake salmon into the bowl, add the egg and gently stir to combine. Form into 8 uniform cakes. Chill in refrigerator for 1 hour or in the freezer for 15 minutes. 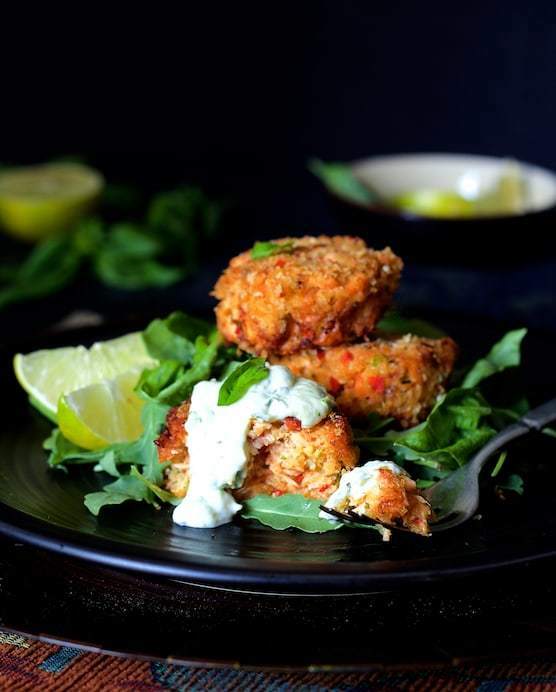 Coat salmon cakes with panko. Heat oil over medium-high heat in a non-stick skillet or sauté pan. Place salmon cakes in hot oil, working in batches if necessary. Reduce heat to medium. Cook 2-3 minutes per side or until nicely browned. Place on a cooling rack set on a baking sheet or on aluminum foil to drain. AIOLI: Combine aioli ingredients in a food processor or blender. Process until smooth. Serve with salmon cakes.